It’s kind of funny to me that this month I’ve been talking up game-day snacks as much as I have. A few years ago my cookbook Gourmet Game Night was released and I spent a lot of time explaining that the “game” I had in mind was Scrabble or dominoes, rather than venison or football. Though in truth, the latter was a least a close approximation. Whether our attention is directed at watching a football game or playing a poker game, the ultimate eating goal is the same: enjoying food that’s flavorful, interesting and satisfying while easy to eat and not at all distracting. Which eventually prompted this blog post a couple of years ago, embracing game-day eats right up there with food for board game nights. With the release of Salty Snacks last fall, it only makes sense to be on call again — play-off games, Pro Bowl, Super Bowl, heck even hockey again! They’re all ideal excuses to forget about a square meal and instead break out our favorite snack items. I posed to my Facebook crowd recently a question about what they serve while watching sports on TV. I got a couple mentions of fresh vegetables and hummus, but most confessed to falling back on comfort-food favorites: pizza, nachoes, chips & dip. And believe you me: I’m all for pizza, nachoes and chips & dip. Truly. But as an author, when I got all jazzed up by the idea of writing about Salty Snacks, it was going to be with some new twists. You don’t need me to tell you how to sprinkle grated cheese over a mess of tortilla chips and bake them until melty. But you might need me to prompt you to make a batch of savory peanut butter cookies with dukka or parsnip and carrot chips. So the Big Game is just days away now. I’m sort of torn about the fact that the Seahawks didn’t make it, would have been filled with local pride of course, but my anxiety level will be much lower on Sunday….. While you’re plotting out all your favorite things to snack on that day–or any day you’ve got a hankering for a slightly decadent snack–consider this variation on the ubiquitous artichoke and [fill-in-the-blank] dip. This recipe’s from my Salmon book in the Northwest Homegrown Cookbook Series I did a while back. The recipe would work just as well with crabmeat or tiny bay shrimp (both of which come precooked so just stir them into the sauteed onions and proceed directly to cooling). 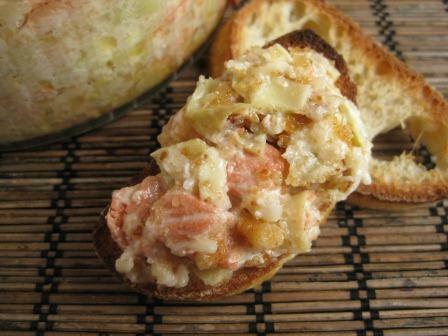 This salmon twist on the classic crab and artichoke dip is perfect not only for game day but also a buffet supper or a cocktail party bite, particularly if you spoon the mixture onto crackers or toasted baguette slices for easy finger food. If you like a little spice, you could add a tablespoon or so of minced jalapeño chile. Heat the oil in a medium skillet over medium heat. Add the onion and cook, stirring often, until tender and aromatic, 2 to 3 minutes. Add the salmon and cook, stirring often, until the salmon is just cooked through, 3 to 5 minutes. Transfer the mixture to a medium bowl, season lightly with salt and pepper and set aside until fully cooled. Add the mayonnaise, Parmesan cheese, and artichoke hearts to the bowl with the salmon and stir well to thoroughly blend. Transfer the mixture to a 1-quart baking dish and sprinkle the bread crumbs evenly over. Bake until the mixture bubbles around the sides and the breadcrumbs are lightly browned on top, 25 to 30 minutes. To serve, set the baking dish on a large plate and surround the dish with crackers and/or baguette slices for scooping or spreading.